Tenacity, perseverance and dedication were the traits that first earned Truman athletics the name Bulldogs 100 years ago. While much has changed over the last century, these core qualities remain strong on campus. This spring, students celebrated the Bulldogs’ centennial with a week of events leading up to Truman’s National Spirit Day, April 3. Although the term “bulldogs” was first used by coach O.C. Bell to describe the football team’s tenacity in 1909, it was not until 1915 that Bulldogs became the official name. After several losing seasons — and no wins at all in 1914 — a committee was formed to see what could be done about reviving school spirit. While the students were very supportive, the committee knew they were discouraged, so it was decided that some type of emblem was needed to inspire enthusiasm. 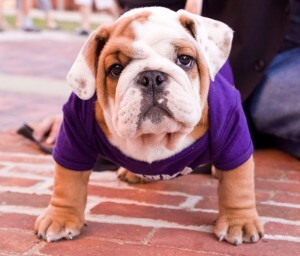 The committee suggested the bulldog be adopted as the team mascot because of his perseverance and ability to hold on and fight until the very end. This perfectly represented not only the team’s dedication, but also the loyalty of the student body. The 1914 team never gave up and neither did their fans, who always gave them a hearty send off and welcome home for every away game. It was the baseball team that first played under the Bulldog name in the spring of 1915. 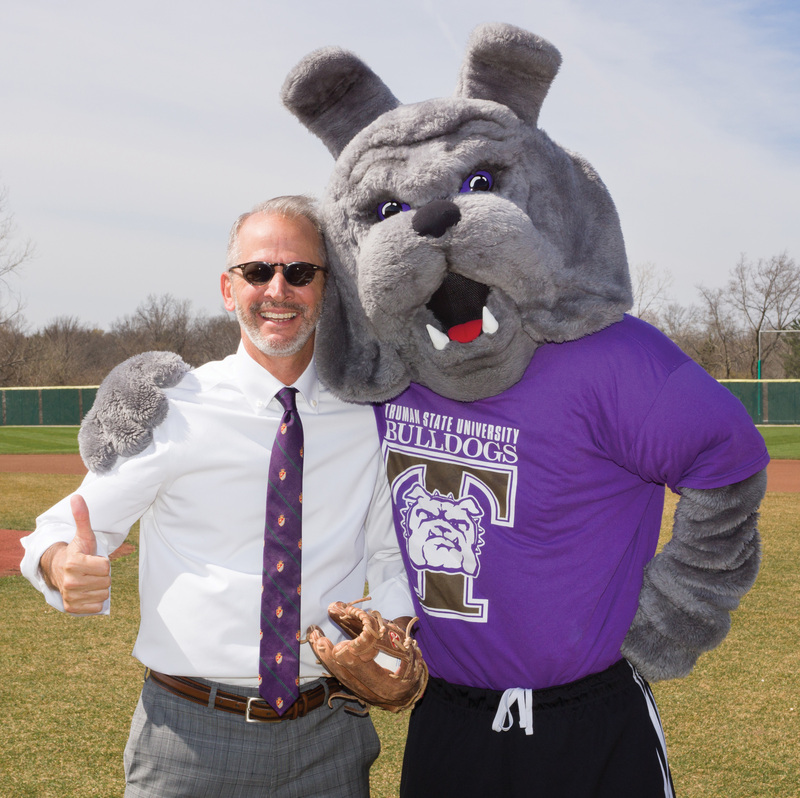 To honor this tradition, Spike the Bulldog threw out the first pitch at a Truman home baseball game as part of the week of festivities. Other events in the weeklong celebration included an open mic night and murder mystery improv comedy night. 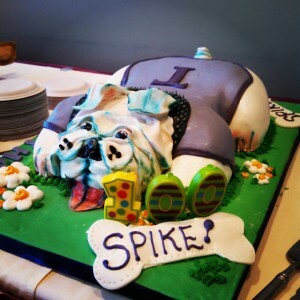 Another highlight of the week was an official 100th birthday party in the Student Union Building where Spike was joined by members of more than a dozen campus organizations and received a bulldog-themed birthday cake. More information about the Bulldog mascot can be found at library.truman.edu/archives/mascot.asp. Karina Critten stands by her class project display outside the Student Union Building. On Family Day, Critten’s group raised $1,000 in donations for the Food Bank for Central and Northeast Missouri. 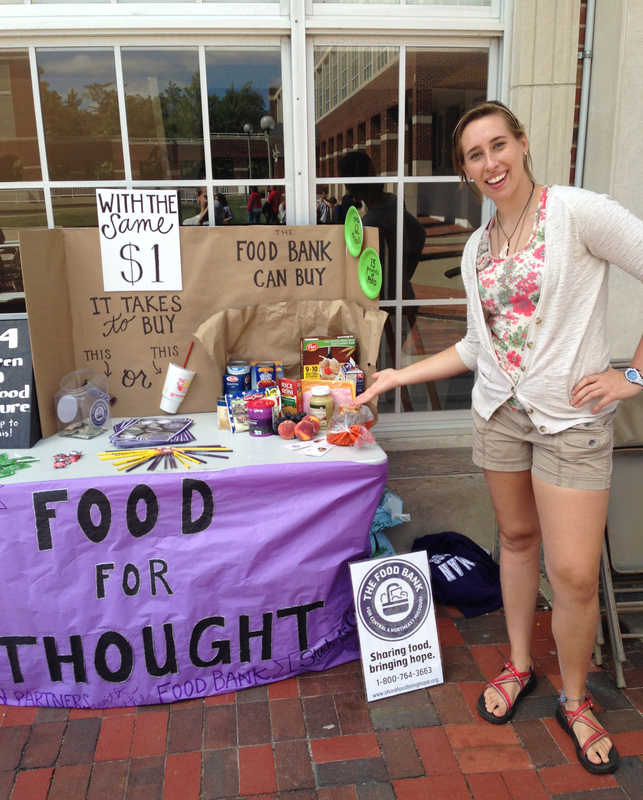 In the fall semester, students in two of Truman’s nutrition courses partnered with the SERVE Center to raise money for the Food Bank for Central and Northeast Missouri. The classes divided into 14 small groups, each of which planned a fundraiser as part of a service-learning opportunity. Students began planning events, raffles and donation requests after learning the Food Bank is able to purchase 15 pounds of food for families in need with only one dollar. These student-led projects culminated during the Big Week of Giving in early October when the classes established donation tables on campus and throughout Kirksville. The first of these fundraiser events was completed Sept. 13 when one group set up a table display outside the Student Union Building and asked visiting parents and family members to consider donating to the cause. By sharing statistics about hungry families needing help, and how a small donation can make a big impact, the team exceeded their project goal and raised $1,000. Another fundraising project incorporated the help of University President Troy Paino. Raffle tickets were sold and the lucky winner was able to pie him in the face at the Sept. 27 football game. There were also several fundraisers throughout the semester in conjunction with local restaurants. All of the proceeds raised in these projects were donated directly to the Food Bank for Central and Northeast Missouri. 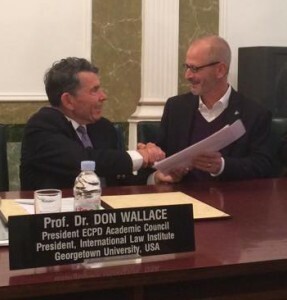 With hopes of expanding academic cooperation with institutions abroad and increasing enrollment in select Truman graduate programming, University President Troy Paino traveled to the Balkans and brokered a deal with the European Center for Peace and Development (ECPD) in October. 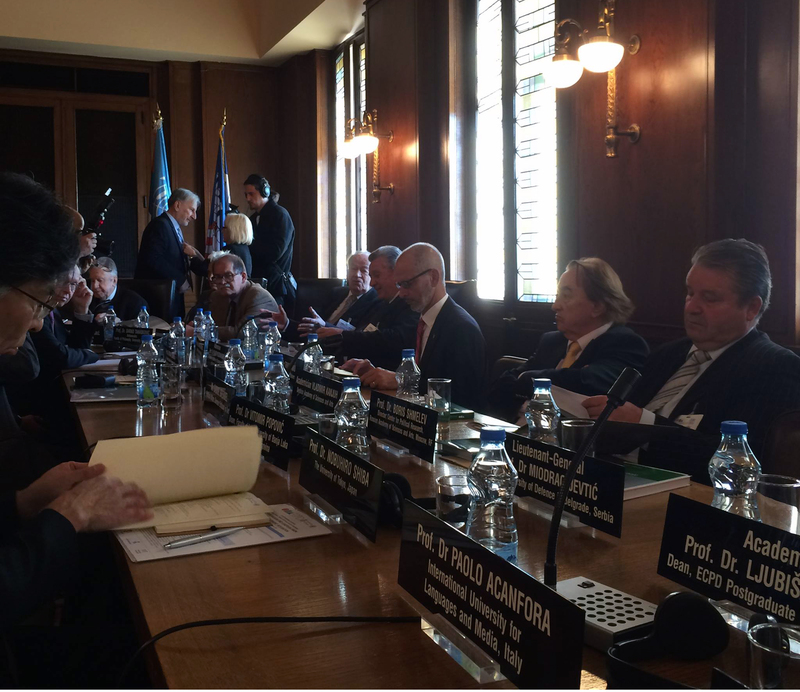 Headquartered in Belgrade, Serbia, the ECPD is a branch of the UN-mandated University for Peace and collaborates with other academic institutions to help citizens of the Balkans and elsewhere receive needed education to advance peace and prosperity in their countries. Currently, Truman administrators are working with their regional counterparts to explore possible options for offering Truman’s Master of Arts in leadership online to students. These options include the possibility of offering select coursework in one or more possible elective tracks, including content from Truman’s existing graduate certificate in sustainability and environmental studies, as well as select coursework in other fields in which regional partners have expressed interest. The team is optimistic that at least some coursework can be offered to students in the region during the 2015-2016 academic year, pending review and approval by faculty governance and accreditors in the U.S. and overseas. In addition to the online coursework, administrators are also looking at opportunities the Balkan sites might present for expanding the University’s non-credit summer youth programming. The Pershing Society Scholarship Program celebrated its milestone 40th anniversary March 1 on campus. Approximately 300 Pershing Scholar alumni and current Pershing Scholars, administrators, faculty and staff involved with the program, were in attendance to honor former University President Dr. Charles McClain for his vision and foresight in establishing the program. A campaign to fully fund a Pershing Scholar was announced with a $1 million goal. Since the launch of the Thanks a Million, Dr. McClain! campaign on June 1, 2013, nearly $600,000 has been raised in cash, pledge and estate gift commitments. Attendees enjoyed campus tours and a welcome reception. Later in the day, everyone gathered for a luncheon that featured several speakers including Rhodes Scholar Andrew McCall (’10), Missouri Supreme Court Chief Justice Mary (Rhodes) Russell (’80), Foundation Board president and Board of Governors member Sarah (Hartmann) Burkemper (’92), Alumni Board member Pamela (Weatherby) Popp (’83), University President Troy Paino, and the honored guest, Dr. McClain. More information on the Pershing Celebration, including the memories others have shared in the online guestbook, is available at pershing40th.truman.edu. To inquire about the Thanks a Million, Dr. McClain! campaign, contact Brad Chambers or Denise Smith in the Office of Advancement at (660) 785-4133. Charles Tharp reveals a school newspaper from the 1954 Science Hall time capsule, which was opened in May. Pictured, from left to right: University President Troy Paino, Jon Broyles of the Freemasons, Professor Emeritus Max Bell, Tharp and President Emeritus Jack Magruder. Thanks to alumnus Charles Tharp, attendees were able to take a step back in history when a time capsule enclosed in the 1954 Science Hall cornerstone was opened during a ceremony on campus May 5, 2014. Tharp, who had owned a local landfill, grabbed the cornerstone when portions of the Science Hall building, now known as Magruder Hall, were demolished to make room for renovations and additional construction in the 2000s. It sat in his yard for the last decade and this past spring when he was cleaning vines from the stone he noticed the weather had eroded some mortar from the back, revealing the time capsule. Tharp, contacted his friend and former professor, Dr. Max Bell, who had been on campus when the Aug. 5, 1954, cornerstone dedication took place. Bell, a professor emeritus of botany who divides his time between Florida, Kirksville and Alaska, agreed to help Tharp with the opening of the time capsule. Also assisting with the reveal was Dr. Jack Magruder, president emeritus of Truman. Magruder was a sophomore chemistry major at the time of the 1954 dedication. As the cornerstone was originally dedicated by the Freemasons of the Grand Lodge of Missouri, Jon Broyles, grand master of the Grand Lodge of Ancient, Free and Accepted Masons of the State of Missouri, spoke about the history of the Masons and their role in building construction. Buried in the time capsule were copies of the school newspaper, course schedules, student handbooks, alumni magazines and a copy of the Aug. 5, 1954, dedication speech delivered by Phil Donnelly, Missouri’s governor at the time. Thanks to Tharp’s willingness to donate the cornerstone and the time capsule back to the University, the contents are available for review in the special collections gallery located on the third floor of Pickler Memorial Library. The cornerstone will be placed close to its original location on the north side of Magruder Hall. Photos from the time capsule unveiling event may be found at photos.truman.edu. This entry was posted on June 4, 2014 by kbest. 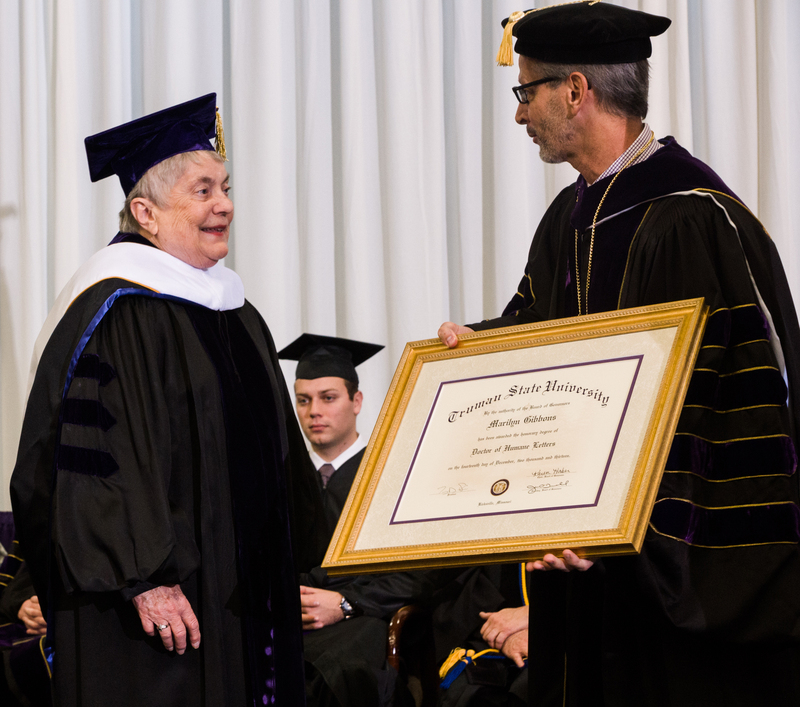 Marilyn Gibbons accepts her honorary Doctor of Humane Letters degree from President Troy Paino during commencement ceremonies Dec. 14. Gibbons is only the fifth person in the University’s history to be awarded an honorary degree and is believed to be the first individual to have devoted 50 years of service to the University. She started working in the Registrar’s Office in 1963 and officially retired Dec. 31, 2013. During her years of service, she worked under 10 of the University’s 16 presidents. • Brent Buckner, professor of biology, received the 2014 Excellence in Education Award from the American Society of Plant Biologists for his commitment to innovative teaching and high-quality mentoring, along with his engagement in funded projects that reach far beyond the University. He was commended for his impressive record of working with undergraduate students on meaningful research projects leading to mutual publications, as well as placing students into excellent graduate and professional programs. • Robert B. Graber, professor emeritus of anthropology, served as guest editor for a special issue of the higher education journal On the Horizon. 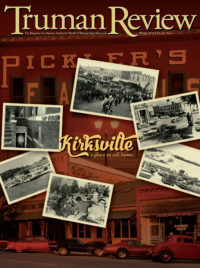 It can be found online at emeraldinsight.com. • Jesse Krebs, associate professor of clarinet, performed Mahler’s Symphony No. 9 with the Kansas City Symphony (Jan. 22-26) at the Kauffman Center for Performing Arts. • Chad Montgomery, associate professor of biology, has been selected as the new director of the Office of Student Research. He succeeds Michael Goggin, professor of physics, who served as the interim director during the past year. The OSR serves as a central resource for student research, scholarship and creative activities at Truman and works to promote, facilitate, highlight and assess faculty-mentored student research across all disciplines. • Troy Paino was recognized as the “most devoted” university president by the website NerdScholar. In February, in honor of Presidents Day, the site compiled a list of personable presidents. The site is dedicated to helping students find the right school for them. • Truman’s MLK Day of Service was recognized in the January edition of Missouri Campus Compact (Vol. 5, No. 2).